The Paul Scott Lecture was well attended. The members there were in for a treat; watching a seasoned pro entertain an audience of about 30 invited children from the local beavers. He had the children in the palm of his hands throughout the 45 minute show. Paul’s show was full of audience participation with lots of great one liners that kept the whole audience laughing. He gave us his take on some classics, Professors Nightmare, Farmyard Frolics, Pavel’s Rings, Belisha Beacon, Skeleton in the Cupboard etc. Finishing with what I think is possibly the best kid’s trick I have ever seen; the reaction from the children was absolutely brilliant. It probably had a lot to do with Paul’s handling of the routine, the trick, Run Bonzo Run, is a real winner. Our President Mark Harrison then introduced Paul to deliver his lecture on the show just witnessed. Before I say anything I will declare a vested interest, I sell a lot of products that Paul has invented or marketed over the years, so I obviously have a high regard for him & what he does. He has earned a living as a full time pro for a very long time & he is still working & keeping busy. He is still able to put the energy into performing to a degree that will work with the demands & tiny attention spans of modern youngsters. He did this very well with a group of Beaver Scouts bought in to challenge him. After the children had gone, Paul talked on his views on children’s magic. I think he showed how longstanding classics still hold well today. His Laundry Routine, Belisha Beacon Wand & his brilliant routine with Run Bonzo Run. Any kid’s entertainer could not fail to learn something from Paul’s performance, even if it was only a piece of ‘business’, but those with an open mind could have learned a great deal more. I am not going to catalogue everything Paul did, you should have been there. 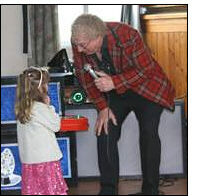 Just two points, the best microphone technique I have ever seen with any children’s entertainer, & without massively expensive equipment, the PA did it’s job, no feed back a & most important no distortion which I hear all the time with kids entertainers, particularly at lectures. The advice was there for everybody to benefit from, if they were really listening to what he said, worth the price of the ticket as they say. Finally, some advice from him about using different size amplifiers for different venues. None of the options Paul uses are expensive equipment, but he always uses an amplifier even at a house party. We can all make ourselves heard but this way you stay in control without having to ‘project’ –which when doing several shows a day makes a big difference. A great night glad I went, but as I said I’m already a fan so I’m biased.